We were looking for a couple of old photos of Kaylee for the graduation slideshow. Oh my, the memories... her white wispy hair and deep chocolate eyes, dimples, giggles, requests of "hold you? 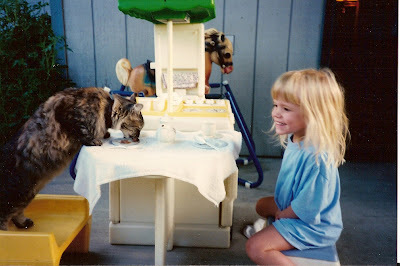 ", tree climbing, tea parties with Jenny, Connor, and any willing pets, miles of riding the range on the springy plastic horse or the wooden one Grandpa McC made, dancing while daddy played "Linus and Lucy" or "Pink Panther" (or momma played "Jingle Bells Jubilee" - even in mid-summer!). What a delight you continue to be, Kaylee. God has guided and kept you, and continues to do so, maturing you into a young woman who honors Him and who "delights in making others glad in Him." We rejoice in your upcoming graduation and all that God has for you in the years to come. how sweet - what wonderful memories, and what a great picture!